The Omni Group has released OmniFocus 3 for iOS, a major upgrade to the company’s powerhouse task management app that adds significant new functionality while decreasing its complexity in normal daily use. The biggest enhancement in OmniFocus 3 is the transformation of “contexts” into a more flexible system of “tags” that’s found in many other apps. While tags serve many of the same functions as contexts, users can now assign multiple tags to any task or project, reorder tags manually, and even assign a tag to appear in the Forecast view. Other new enhancements include a customizable inspector that allows users to hide fields that they don’t normally use, the ability to set multiple custom notification for any task or project and a revamped rules system for creating custom perspectives. The screen layouts have also been enhanced in OmniFocus 3 for iPad to allow a multi-panel view that takes full advantage of the larger screen, providing a powerful desktop-like experience. along with improved keyboard support, and much improved drag and drop support. Events from your iOS Calendar app can also now be displayed in the Forecast view, and SiriKit has been brought to the Apple Watch, allowing users to dictate tasks directly into OmniFocus from their wrist. 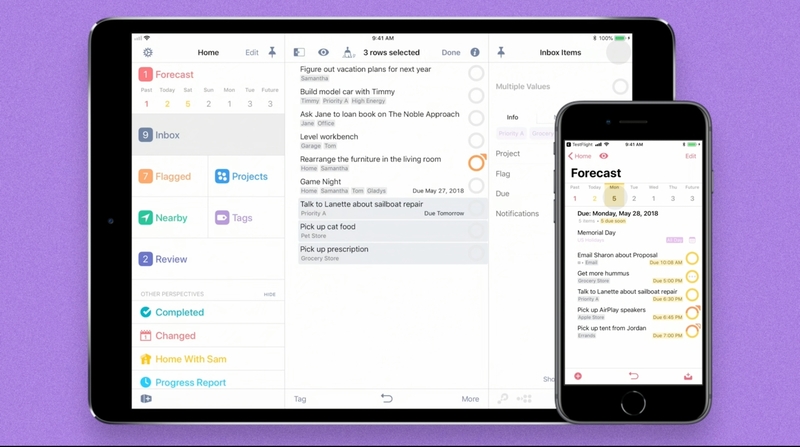 OmniFocus 3 for iOS is a free download from the App Store with a 14-day trial, with the ability to purchase either the Standard ($40) or Pro ($60) versions from within the app; upgrade discounts are also available for users who already have an older OmniFocus version installed.